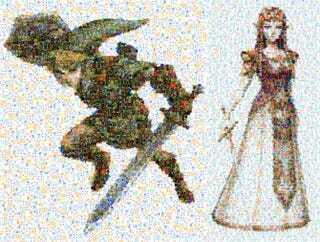 It is hundreds of screenshots, composited into recreations of artwork featuring the two stars of Nintendo's famous adventure series, Link and the Princess Zelda. These screenshot mosaics were made using shots from every single Zelda game ever made. Yes, even the handheld ones, and yes, even the new ones, and yes, even the awful CDi ones we never really like talking about that much. You can check out the detail on the Link one here, while the Zelda one is available at the link below.